Life is full of choices, and the choices we make will determine what type of person we will become. Whatever we set our minds to do and spend our time doing, will be the product of who we are. The reality is, we all have to prioritize in life. Whether it’s prioritizing work or family, we have to determine what our priorities are to live a healthy and balanced life. If you have a full-time job and a family, the amount of time you can allocate to hunting is going to be limited. To live a balanced and happy life—plus hunt enough to be happy—you must determine what is important. If you are chasing every desire without first prioritizing, there is a chance you're making yourself miserable. Let's say you decided to sit out the opening weekend of the upcoming bow season to spend time with your family because of some important event. As soon as you wake up, you check the temperature, check the barometric pressure, and a cold front is coming in. You think to yourself, "Great. I'm missing it—everything is perfect, and I’m sitting here at the house.” Sure enough, you jump on Facebook and your co-worker just arrowed a giant of a deer. Now your day is ruined, and you make sure to ruin everyone else's day as well because you decided to stay home, but your heart was in a treestand. So instead of living with your decision, you're miserable. Is that fair to your family? Heck, is that even fair to yourself? You prioritized this day with your family over hunting—now it's time to live with that decision. Often we end up stealing time from ourselves by second-guessing, and overcomplicating life. Recently, I read a conversation online between a young hunter making a jab at an older man because the older hunter kills 15+ turkeys a year in multiple states—and he also hunts an insane amount of days. The young kid was obviously a little jealous and gently eluded to the fact not everyone can do that. He was right. The two hunters likely had 10-15 years between them and were obviously at different stages of their life—which the older and wiser hunter pointed out. Stage 1: Years 15-21 — These are hard years, but also some of the best. These years are about the time you start adventuring out on your own—your resources are limited, but time is not. This is also the stage where a hunter starts developing their style and makes plenty of mistakes. But as we all know, mistakes are just a foundation for success in the future. Stage 2: Years 21-40ish — These are the dry years for a hunter because your priorities begin to shift. Families and careers begin, debt starts to accumulate, and you have that little thing called a mortgage. For a hunter, this is a tough time because they're in the peak physical condition, they have acquired the knowledge to be successful, and they do have the resources to buy more gear and possibly travel to hunt. But they have other commitments: ballgames, church events, weddings, chores, work and more work. These are the years you have to understand your priorities and take advantage of the time available. Stage 3: Years 40-55 — These are the Golden years. Don’t get fat and out-of-shape because this is when the hunting should be good. The kids are older now, unless you started late in life. Hopefully, you’re at a peak financial stage of life, and you now can make the time to hunt just as you’ve always dreamed. Now is where every hunter should take advantage of every minute. Stage 4: Years 55-80 — By now, you should have taken someone under your wing and have taught them the ropes. If not, find someone to take—especially those grandchildren. They’ll always remember you for it. Go ahead and pay for those dream hunts and stop doing it all on your own—you get a pass! Stage 5: Years 80-Death — You've become a mentor, you've passed on the wisdom. Now maybe you can't venture out too far, but you can promote the hunting culture, you can give back with time at events-building a better tomorrow. Now that life has been laid out into categories; hopefully you have a better vision for tomorrow, and we can get on to the application of prioritizing. 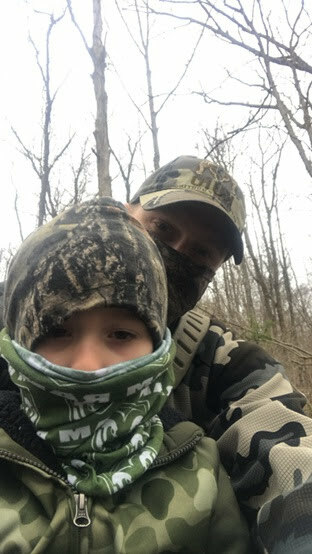 Adam and his son this past fall. 8 Days of PTO for deer season. 12 Days of PTO for a family vacation, and make sure to make the most of holidays and family time. Don’t let hunting get in the way of church. Clear my schedule for the weekend opener of turkey season. Once you have these events on paper, you can then apply them to the calendar. The trick is to make sure nothing comes in the way of those dates you’ve set aside. Lock those dates in and get the most out of them. If you want to see your hunting goals come to fruition; you have to plan, and you have to work. To do this, you need the time, and you also need the time to GO! Make sure you have a goal, plan, and your priorities straight to make this hunting season a success. If this article resonated with you and you sometimes carry a bad attitude around the house, just remember that you’re just in a season of life. Set your priorities, talk to your spouse and kids about what your hunting goals are and share your time. Never forget to live in the moment and enjoy that moment—always make the most of it. Sometimes that is easier said than done. To see more from Adam, be sure to check out his podcast - The Down South Hunting Podcast. Older PostA Great Deer Hunter - How Is It Defined?